'Gangster' Peppa back in China's good graces in Year of the Pig - Integration Through Media ....! BEIJING, (AFP): Roasted as a subversive symbol and chopped from a video streaming website in China, it seemed Peppa Pig, the loveable but imperious British cartoon character, faced a bleak future in the Communist-led country. But her popularity has risen unabated, and now just months after state media slammed her as an emblem of the counterculture, she is playing a starring role as the country ushers in the Year of the Pig on Tuesday (Jan 5). A new film titled Peppa Pig Celebrates Chinese New Year is being released on the first day of the holiday. The movie shows Peppa celebrating Chinese New Year with two new friends – “Jiaozi” (dumpling) and “Tang yuan” (glutinous rice ball) – named after popular local delicacies. Now Entertainment One – the Canadian media company that currently produces the series – is banking on her popularity translating to the big screen. The promotional clip shows a rural villager’s quest to find out what his city-dwelling grandson wants when he asks for “Pei Qi” – Mandarin for Peppa Pig – in a bid to create the perfect Chinese New Year gift in time for the boy’s annual visit. The trailer struck a chord with Chinese audiences because it “showcases the same values highlighted in the movie – family, reunion, harmony and love”, Zhang wrote on Weibo. The film has already earned 12 million yuan (US$1.8 million) in presale tickets. 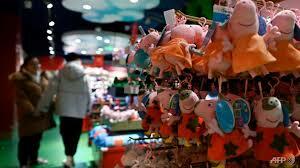 In a country where the pig is a symbol of wealth, Peppa merchandise is in high demand. There are even themed attractions – Peppa Pig World of Play opened in Shanghai in 2018 with another set to open in Beijing this year. But the success of the Peppa brand has also brought headaches for the cartoon’s creators. Copycat merchandise – from cookies to pencil cases – can be easily found in corner stores in Chinese cities.